Swiss Post, the national postal service of Switzerland, takes employee well-being seriously. The PostActivity scheme is an example of this, offering employees a way to enrich their lives and those of their colleagues through activities beyond work. 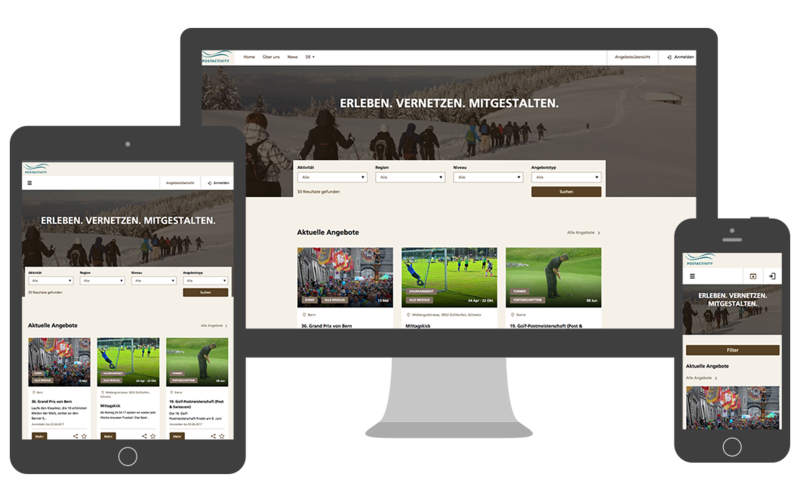 The PostActivity platform allows staff of Swiss Post, including those in training and already retired, to offer and participate in activities - during a lunchtime break, after work, at weekends - with their colleagues. Activities could include a cookery course or lesson, a game or tournament, a cultural trip or more. Dozens of opportunities are currently on offer on the website, all proposed and organised by Swiss Post staff. Participation in all activities is kept affordable, and the cost of mounting them can be supported by Swiss Post itself. Divio were a responsive and imaginative partner for this project. We were delighted with the speed with which the new site was taken from concept to deployment, and the way the multiple skills in the Divio team came together to solve our problems. As a public enterprise, Swiss Post must meet very strict legal standards for accessibility, including of course web accessibility. The site's visual design - colour schemes, layout, spacing and so on - contributes to accessibility. It features high contrast ratios for example, and is also compatible with users' OS accessibility modes that themselves modify screen contrast, brightness and so on. Several rounds of internal and external testing helped prove and refine the design. A site with complex interactivity can present significant challenges to users of screenreaders. It's possible to reduce the burden on these users considerably, by optimising the data structures in the page so that screenreaders can always make the required information available to the user in the right order and at the right moment, or with minimum extra work if it needs to be obtained from elsewhere in the page. Putting work into optimising the page's markup to achieve this, for example in the forms that drive much of the interaction with the site, saves the end user from having to work harder to make use of the site. The user of the PostActivity site will engage in a lot of interaction with it, and the behaviour of pages and elements in them, and within extended interactive workflows, needs to make that interaction as straightforward and easy as possible, including for users who are unable to benefit from a synoptic view of the process, or those not able to use a pointing device such as mouse. The interfaces are fully tabbable, with no unexpected 'focus traps' for keyboard users. In complex interactions such as searches, the page places focus on the most logical part of the interface, to minimise the effort required by the user. Again, the needs of the user working with devices such as screenreaders are prioritised to ensure the best possible experience. In order to meet Swiss legal requirements for storage and protection of personal data, the project required a Swiss location. The Divio Cloud already had options for location in the USA and the EU, but PostActivity was the first major project hosted on our Swiss-based region. Our Swiss region is right in the heart of western Europe, with first-class connectivity and multiple 10GB links to major Internet backbones, putting it within 12ms of most major European industries and markets.